Scene setting: Thom Browne’s design team transformed Skylight Modern into a winter wonderland that complemented the brand’s signature grey colour palette. Thom Browne penguins, wall scenes of a small town and a frozen pond-turned-skating rink runway were a few of the elements of the elaborate set. Best in show: A striped coat with a fur trim and collar added a bit of colour to the collection. A houndstooth single-buttoned coat was accented with a fur bottom and cuffs at the wrists, and argyle prints were imagined in padded blazers, stoles and cropped cardigans. 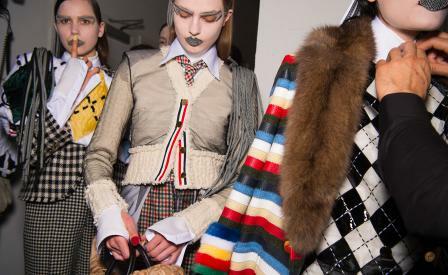 Finishing touches: Swatches of houndstooth fabric, cut into brow and lip shapes covered the models’ mouths and eyebrows, who each entered wearing ice skate style shoes. Strips of fabric layered into the hair resembled unusual hair extensions. Browne’s animal themed accessories have included crab and sausage dog shapes, and for A/W 2017 the designer added penguin backpacks to his zoological roster, which offset the styling’s sinister edge.